Jim Ellis Collision Center's automotive expertise is a product of our sustained interest in industry trends and characteristics. We are privileged to share the latest news and important points with you as a reminder that our most important goal is customer satisfaction. 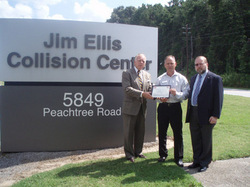 Jim Ellis Collision Center Is Porsche Certified! Jim Ellis Collision Center is a Porsche Approved Collision Center in Georgia and the Jim Ellis Collision Center is part of a select number of shops and only the 2nd dealer shop to accomplish it. Jim Ellis Collision Center is the only dealer shop in the United States to become Audi Certified, Volkswagen Certified and Porsche Certified! Keep an emergency kit in your car: a disposable camera, cell phone, pen & paper will be needed at the scene. Exchange information with everyone involved: name, address, phone numbers, insurance information, driver's license numbers and license plate numbers. Get a police report. Know your insurance policy: speak with your agent ASAP. Choose a repair facility authorized by your vehicle manufacturer. Call your dealer. Do I have to use the insurance company's recommended shop? No! Under Georgia law, you have the right to have your vehicle repaired where ever you wish. Do not let an insurance company tell you otherwise. We are the dealer...we represent your vehicle's manufacturer......we will put your interest first. Can an insurance company make me take my car to a certain shop? No, you have the right to choose the repair facility. Most insurance companies want your vehicle properly repaired and they want you to be satisfied....However, there are insurance companies who will direct you to their own program shop primarily to reduce their expense. We believe quality should come before cost and as a matter of policy we do not cut corners. This is an important step in protecting the value of your vehicle. Please contact one of our qualified service advisors for our warranty details. Who can authorize repairs to my vehicle? Only you can authorize repair work on your vehicle. We understand and respect this. Whether minor or extensive, our collision center will make sure your vehicle is assessed and estimated correctly, and repairs done to manufacturer's specifications. Why should I insist on all OEM parts? Aftermarket or salvage parts often do not meet OEM standards for fit, finish, corrosion protection, construction or safety. There is no way to alert you of recall or defective parts from the aftermarket manufacturer. We believe the best repair result comes from using original equipment parts.....if you have the choice, YES, insist on orginal parts. Restoring your vehicle with the proper paint match is one of the most important parts of the repair. A poor paint match can greatly affect the value of your vehicle. With over 60 years of combined experience, our paint department's color match ability is second to none! How long should the repairs take? The repair process only begins after an administrative process is completed. During this first administrative process, the insurance company must establish fault and verify coverage. We will then begin the inspection to determine repair cost. The insurance company will check the value of the vehicle against the repair cost estimate and make a claims decision; is the vehicle repairable? or is it a total loss?? We will complete the disassembly and identify all the damage. We then contact the insurance company for another inspection and proceed with the parts order. Once parts have arrived (typically 2-4 days) we will continue the repair process.The body & frame/unibody repairs will be completed and the vehicle is sent to the paint shop. After paint, all painted panels are buffed & polished to insure the best possible match.The vehicle is assembled & cleaned up for a review by our quality control manager. This process usually takes 1 working day for every 4 labor hours of repair. This is the standard used to calculate rental vehicle authorization and payment reimbursment. It is worth noting that the administrative process can take longer than 1 week in some cases. Stay involved with your claim. Know the insurance company's claim representitive by name and have their phone number. Atlanta, GA July 23, 2009 -- In early July 2009, Silver-star veteran Doc Scheffler went to Jim Ellis Collision's Marietta estimate and drop location for a new hubcap for his car. When Marc Sizemore, director of the Jim Ellis Collision Center, noticed the silver star medal on the front license plate. Mr. Sizemore asked Mr. Scheffler about his tour of duty in Iraq because the Silver Star - the third highest honor in the Army - is awarded "for gallantry in action". While the two gentlemen spoke, Mr. Sizemore found Mr. Scheffler's hubcap in stock, but refused to accept payment in honor of Mr. Scheffler's service. Sizemore, who was in the Air Force, also mentioned that his oldest son, John, is now a senior at West Point. A week later, on July 15, 2009, the Department of the Army presented Sizemore with a Certificate of Appreciation that reads: "The Department of the Army salutes you and is appreciative of your patriotism for demonstrating unwavering loyalty and support for our Army and its sister services throughout Georgia. Your pride and dedication for our soldiers and families as they serve our country reflects great credit on you, your community, our state and our Nation." The award was presented by Duke Doubleday, Civilian aide to the Secretary of the Army for Georgia, and veteran Doc Scheffler.